babbie slide bouncy castle hire warrington. Our 15ft x 17ft pink barbie slide castle is great for all those girls that not only love Barbie, but love PINK!This bouncy castle has pictures of Barbie and Ken on both front pillars and decorated with bows,it also has a 3ft slide at the side of the castle. 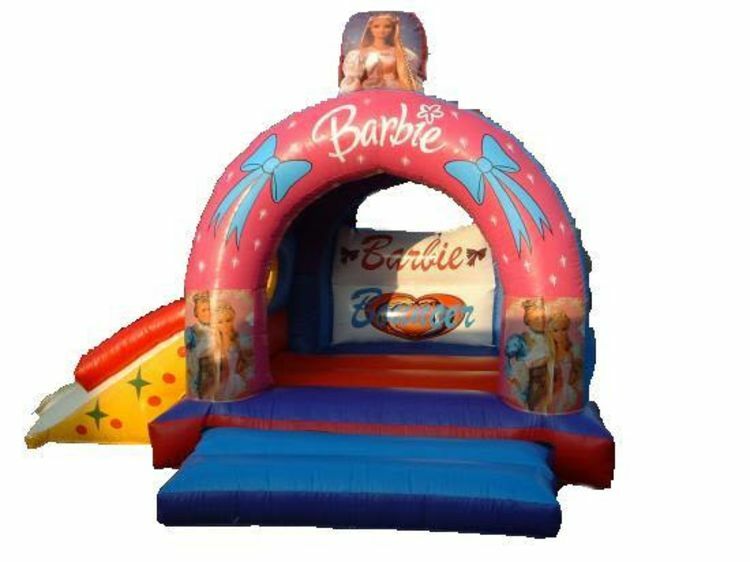 Perfect for any birthday party.This themed bouncy castle has a raincover so whatever the weather you can still have fun on our Barbie Slide castle.The required space you will need is 17ft x 19ft,the height of this bouncy castle is 12ft.If the bouncy castle is going indoors,please ensure the celing height of the venue where the bouncy castle is going is higher than the bouncy castle height.We deliver our themed bouncy castles, inflatable slides,rodeo bull hire,plus are assault courses and adult bouncy castles and domes,to Merseyside & Liverpool, Widnes, Runcorn, Wirral,Warrington, and St Helens, and some of these areas and further areas will be a additional fuel charge or toll/tunnel charge.Check our delivery checker on our home page,it will tell you if there is a charge for your area.